By Dan Ambrose: Former IBF welterweight champion “Showtime” Shawn Porter and his father/trainer Kenny Porter both see IBF/IBO/WBA/WBC middleweight champion Gennady “GGG” Golovkin (37-0, 33 KOs) beating challenger Saul “Canelo” Alvarez (49-1-1, 34 KOs) on September 26. Porter, 29, doesn’t go into detail in giving reasons why he believes Triple G will best Canelo, but his father Kenny sees Golovkin as simply the better boxer of the two. That’s kind of a surprise, because the consensus with the boxing public is Canelo is the better boxer. Golovkin is just the bigger, stronger and more aggressive fighter of the two. Golovkin also has a superb amateur record. In Canelo’s case, his amateur career has been at the pro level fighting a lot of weaker opposition up until recently. For Canelo’s sake, he needs to make sure there’s very little fireworks on September 26, because that will mean he’s getting hit, and I don’t think he can take the kind of punishment that Golovkin will be dishing out. Canelo hasn’t faced any quality punchers his own size during his career. The only guy with any power that Canelo fought was James Kirkland, who looked exhausted after the 1st round. 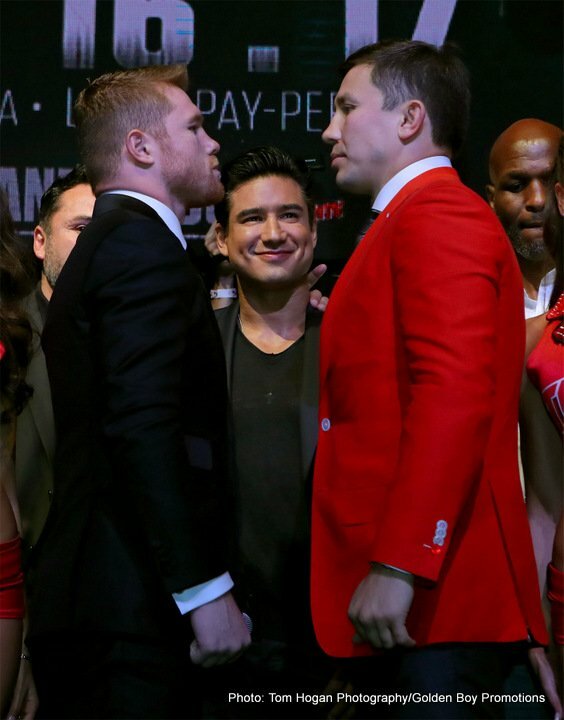 Canelo never had to fight anyone that could test his chin – and midsection – the way that Golovkin will. This could be bad fight for Canelo, as resume has not prepared for him to fight a puncher like Golovkin. Canelo has fought a lot of well-known fighters like Alfredo Angulo, Kirkland, Shane Mosley, Kermit Cintron, Ryan Rhodes, Floyd Mayweather Jr., Amir Khan, Miguel Cotto, Julio Cesar Chavez Jr., Carlos Baldomir, Erislandy Lara, Austin Trout, Jose Miguel Cotto and Liam Smith. Unfortunately, those guys are mostly yesterday’s stars and very, very limited fighters for the most part. The only good fighters out of that bunch are Cotto, Mayweather, Trout and Lara. I had Canelo losing to Trout and Lara. His fight with Cotto was arguably a draw. What those fights have shown is Canelo’s talent level is right about at the same level as Trout, Cotto, and Lara in terms of talent. You should be better than that if you want to beat Golovkin. It’s too bad Golden Boy Promotions didn’t give Canelo a REAL test by putting him in with Danny Jacobs or Jermall Charlo You take away Canelo’s entire resume and insert Charlo or Jacobs there in place of all of them, and they would give Canelo more helpful experience than the guys that he’d faced during his career. There have been too weak opponents for Canelo. If Canelo was training to fight someone like Andy Lee, then facing guys like Kirkland, Angulo and Chavez Jr. would be helpful experience for him to have. That’s not who Canelo will be fighting on September 16. He’s fighting Golovkin, and I think it’s going to end badly for Canelo unless he looks a lot better than he showed against Chavez Jr. and Liam Smith. “I got Triple G winning as well,” said Kenny Porter. “I see him winning this fight. I just think he’s the better boxer. He’s more technically sound. I believe when Canelo fought Mayweather, it raised his level. He got so much better after that loss, but he’s another guy he’s going to have to raise his level to, and I don’t think he can pull it off,” said Kenny in explaining why Canelo will lose to Golovkin. Canelo’s undoing against Golovkin will likely be his need for constant rest breaks against the ropes. Each time Canelo takes a rest break against Golovkin, he’s going to absorb major shots to the head and body. If Canelo needs rest breaks in every round like he normally does, he’s probably not going to last more than 6 rounds at best. I hope Canelo is working on his conditioning for this fight because if he retreats to the ropes too many times against Golovkin, he’ll get stopped on September 26. Kenny sees Golovkin’s boxing ability as the reason why he beats Canelo. Kenny didn’t point out what Golovkin did to David Lemieux in 2015. Lemieux came into the fight as a fierce knockout artist, and Golovkin neutralized his power by jabbing him from the outside in the same way he did with Jacobs and Curtis Stevens. Lemieux was unable to lay a hand on Golovkin in that fight. The thing is, the 5’9 ½” Lemieux is taller than Canelo, 5’8”, and he didn’t have the height or the reach to land on Golovkin. Canelo is in worse shape than Lemieux in terms of his limited height and reach. Canelo is a good fighter for the 154lb division, but he’s really too small to beat the top guys at 160 in my opinion. I think Golovkin is going to expose Canelo’s limited height and reach on September 26 by boxing him from afar and holding him off with a jab the way that Trout, Lara and Mayweather all did. All three of those guys handled Canelo with a jab. Lara and Trout were arguably robbed in their fights with Canelo, but they got the better of him with their jabs. That brings up a good point. Golovkin is going to need to make sure he knocks Canelo out, because I don’t think the judges are going to give him a decision. I don’t think that’s going to happen. Canelo is too popular, and I don’t see Golovkin being given a decision over him unless he makes him look limited like Mayweather and Lara did. Of course, Lara lost to Canelo despite limiting him to 31 head shots in the entire fight. The scoring for the Canelo-Lara was so incredibly bad. I had Lara winning 9 rounds to 3, and I was shocked at Canelo being given a wide decision by 2 of the judges. Welterweight Chris Van Heerden is really high on Canelo after working as a sparring partner for him in the past for 7 weeks. Van Heerden says he was shocked at how powerful Canelo’s punches were. Says he’s never been hit as hard as he was by Canelo during his career. However, Van Heerden admits that he’s never sparred with Golovkin. He also didn’t explain why he was working as a sparring partner for Canelo, who has been fighting at junior middleweight for the last 6 years of his career. “I’ve been fortunate to work with Canelo for 7 weeks as a sparring partner,” said welterweight Chris Van Heerden to Fighthub. “I have never been hit as hard as I have by Canelo, with 16oz gloves and head gear. He’s very, very strong. He’s learned so much more. My money is on Canelo; Canelo on points,” said Van Heerden. You can look at what Van Heerden says in a number of ways. The fact that Canelo is unloading on a welterweight during sparring with everything that he has, it suggests that he was going all out against a much smaller guy. Sparring is supposed to be for working on technique. If Canelo was using his size and power advantage to beat up on a weaker welterweight, I don’t think that’s a good thing. Golovkin uses his sparring sessions to work on things so he can improve. He’s not trying to unload on his sparring partners with everything he’s got. If Canelo is sitting down on his shots against his welterweight sparring partners, what does that say about him? ”The power is scary that Canelo carries,” said Van Heerden. ”It’s scary. I’ve never been hit by Triple G. I’ve never sparred with him. I was surprised because I’ve never been hit that hard, and I’ve sparred with a lot of guys. But when I got hit, I wasn’t hurt or wobbled or dropped. The moment I got hit, my hands were up and I got caught on my arm, and it actually moved me in the ring. The thing that was going through my head at that moment was, ‘You better keep your hands up, because you don’t want to get caught with your hands down.’ [Canelo has] Unbelievable power, really. I was there 7 weeks. You could tell from week 1 to week 5, his timing, his speed, beautiful, amazing,” said Van Heerden about Canelo. Canelo did not look unbelievably powerful in his last fight against Chavez Jr. Canelo might be powerful to a welterweight, but his power doesn’t appear to have carried up to the middleweight level. It’s too bad we didn’t get a chance to hear what the middleweight sparring partners are saying about Canelo’s power, because a welterweight’s point of view is meaningless. If Van Heerden was a middleweight, then it would count a lot more what he’s saying about Canelo’s punching power. Right now, the only thing you can say is Canelo hits hard from a welterweight’s perspective. Van Heerden, by the way, was knocked out by Errol Spence Jr. in 8 rounds in their fight in 2015. I wonder what Van Heerden would say about Spence’s power. He was mostly hitting Van Heerden with body shots, and the fight had to be stopped. I think Spence would give Canelo a lot of problems if the two of them were to fight. Spence has a good jab and a longer reach than Canelo. He might be able to do the same thing Mayweather did to Canelo by jabbing him on the outside, and working him over to the body when he retreats to the ropes for a rest break.